Our Fluffy Face Powder brush! These finely milled powders have a barely there shimmer and are available in Cool for rosey-toned skin and Warm for golden-toned skin. With a velvety natural finish ideal for setting makeup or to be used directly over your skin care, our Bronzers impart an instantly radiant, year-round glow. Available in Loose or Pressed (perfect for the tiniest purse). Smooth & silky with delicate light reflecting properties. Our Cool version is especially formulated for rosey-toned skin, creating a healthy, fresh glow without the damaging effects of the sun. With a velvety natural finish, Bronzer may be applied for instant radiance year-round. Smooth & silky with delicate light reflecting properties. Our Warm version is especially formulated for golden-toned skin, creating a healthy, fresh glow without the damaging effects of the sun. 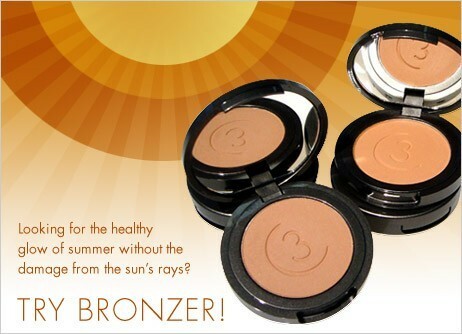 With a velvety natural finish, Bronzer may be applied for instant radiance year-round.